There’s a shot in the third episode of bleak Yorkshire drama Happy Valley that deftly captures two of the omnipresent thematic underpinnings of the show: After a scene of brutal violence, the camera lingers, fixed on the crime scene in the foreground, backgrounded by the gentle slopes of the bucolic valley in which the show takes place. It’s a lengthy take, unique among the series’ largely close-quarters cinematography; it’s a shot openly inviting the viewer to contemplate the violence that’s been done, to let the horror set in, and to wonder how long it will be before anyone in the picture-postcard town knows what’s gone wrong. It helps that this deeply unhappy shire is so impeccably populated. The series rests on the shoulders of Sarah Lancashire, a BBC fixture who seamlessly inhabits Sergeant Catherine Cawood, a dedicated cop with sharp edges that conceal the requisite personal demons—the sort that American networks seem unable to imagine could exist, if The Mysteries Of Laura’s breathless loglines are any indication. But Wainwright’s written this part with plenty of meat on the bones. Lancashire plays equally well off the low-key attraction with her ex-husband (Derek Riddell) and her grandson (the marvelously prickly Rhys Connah), and her sister Claire (Siobhan Finneran, out from the shadow of Downton’s O’Brien). As this is a show in partly about the destructive cycles of desperation and grief, Cawood has plenty of both to handle. Her home life is, at times, almost unbearably morose—her daughter committed suicide after being raped, and Catherine’s raising the child who resulted—but Lancashire makes the most of the wringer, slipping in bone-dry humor where she can and wholeheartedly giving over to grief when the weight becomes unbearable. The families affected by the kidnapping also get their due, providing some of the show’s most fascinating moral quandaries as they struggle against the very things they set in motion. On the other side of the law, the cast of crooks manages a tricky balancing act between dark comedy and pitiless thriller. As the self-justifying accountant Kevin, Steve Pemberton is note-perfect in his fumbling yet necessary attempts to convince nearly everyone he meets that he’s not a monster. As kidnapped student Ann, Charlie Murphy shines in a largely mute performance from behind a strip of duct tape; she keeps Ann from falling prey to anonymous victimhood through sheer force of will. And though there’s really no weak link in the trifecta of kidnappers (which includes Joe Armstrong and Adam Long), it’s James Norton who makes the biggest mark as ex-con Tommy, whose glimpses of flabbergasted humanity are all the more chilling for the heartless void in which they briefly exist. On fronts both domestic and criminal it’s a brutal arc to follow, and the series reflects its emotional viciousness in bursts of physical violence. 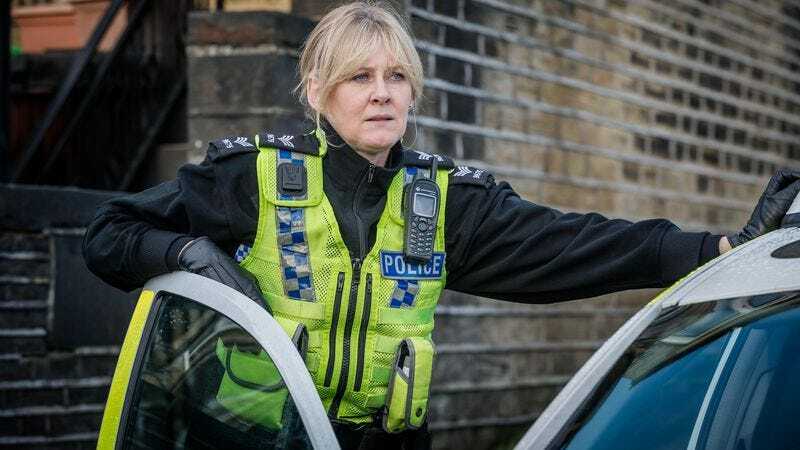 Though time is spent examining some of the impact and consequences of violence on those most closely affected, it’s also worth noting that Happy Valley’s on-screen assaults (which drew some criticism from U.K. viewers) avoid many of the easy SVU shortcuts to emphasize their violence. In fact, the show is more effectively off-putting in its relatively restrained moments, in which a scrap of fabric suggests everything necessary for horror to settle in, and that long shot of a crime scene has more impact with the evidence framed out of sight. The series’ larger scope could occasionally benefit from the same effectiveness and economy of scale; aside from the occasional too-handy plot twist, the show’s biggest struggle is in suggesting wider conspiracies that don’t much apply. The drug trade is presented as the foe that needs fighting, and though it’s realistic enough how little the valley factors into the larger picture of the U.K.’s drug war, it also never quite registers as a threat. And though the series is rife with mentions of higher-ups who must be answered to, notably few feature—only a drunk Councilman ever suggests a rotting system—and most of the police in Happy Valley want only to work together, right wrongs, and keep the peace. “The police can be good, but sometimes they can get it very badly wrong,” one of the kidnapping conspirators tells Ann’s grieving father; for better or worse, this isn’t a show that plans to examine that statement for long. Still, there’s enough depth and complication in the performances alone to buoy the six-episode run, and given the intensity of the criminal specifics, the slow burn feels more like a feature than a bug. At its best, it’s a grim, quietly fascinating drama about a woman adrift, and the workings of a small town caught in its own cycle, living amid its unfinished business, and grasping at slivers of hope down in the valley below.